This assessment is designed to cover foreseeable risks in the conduct of the UH Head. This event is usually held in the middle of the Spring term. Boating for this event occurs mainly from University of London boathouse (ULBH), but one club boats from Tideway Scullers School boathouse (TSSBH). Invitational clubs may boat from ULBH or elsewhere. Racing will be on the ebb tide. The event will be held in accordance with the principles set out in Rowing on the Tideway – A Code of Practice for Rowing on the Tidal Thames above Putney (CPRT) published jointly by the PLA and the Thames Regional Rowing Council (TRRC). It will also be held in accordance with the principles set out in the TRRC code of practice for Tideway head races. The PLA publishes information about the event in the PLA events calendar and this refers to crews taking the racing line when appropriate and to permit overtaking within the Kew restricted zones (where safe). Crews will proceed to the marshalling area following CPRT. The marshalling area is shown at appendix 6, and is alongside Isleworth ait. The race will be held in two divisions, starting at Syon House Pavilion and finishing at the MAA Boathouse. Distance approximately 4000 yards. There will be officials placed along the course to maintain a constant line of sight of the course. There will be officials placed on the western end of both restricted zones at Kew to monitor the progress of powered vessels against the stream and assess the need for ‘line astern’ navigation through the Kew area. History of the UH Head. This event has been held in this location for many years. There have been no fatalities or significant injuries related to the conduct of this event known to the author in this period. 2006: event was rowed over a reduced course because of difficult conditions (wind against tide) beyond Brentford Lock. 2007: Thames Barrier closure immediately prior to the event which reduced the very strong stream to more acceptable conditions, but the novice section was scratched due to concerns about the likely stream conditions. 2009: Collision between a coxless 4 competing in the race and a small powered launch at Brentford Lock; with swamping of the racing shell but no injuries. The incident was reviewed by the PLA and the TRRC RSA, and it was felt that the collision resulted from a failure to keep an adequate lookout on the part of both boats and there was an onus on the event to ensure that the navigation of external boats was not compromised. It has therefore been decided that coxless boats should not be allowed to enter this race, and there needs to be a review of the marshalling positions to ensure proper line of sight coverage. 2014: Very significant fluvial flows during the winter months. Race format changed to exclude novice crews and race time altered to occur during the rise following low water. This provided reasonably settled conditions for the race. Risk of meeting powered vessels coming upriver during race (river not closed); especially in Kew restricted zones. Emphasise need at briefing for officials’ launches to be in designated position throughout marshalling and race. Race officials monitor powered vessel activity (in conjunction with downriver ‘spotter’, specific role for officials 5 and 6 to monitor Kew RZs and provide instruction to competitors during race. Event needs to ensure that there is appropriate tasking for these roles. Sanction on crews for significant contravention of CPRT via standard BR/PLA reporting process. The event will not commence without eight fully functioning launches. Launch drivers need to be aware of the risk of grounding up river towards Syon. If a launch failure occurs during the event, then control will take immediate steps to identify a reserve launch. If one is not available, then the control/CU will review whether suspension of racing is appropriate. It may be possible to transfer one or two race monitors to the single (e.g. 4 and 7). If ‘yellow’ flag then only senior crews may boat on the ebb and the CU and organising committee may sanction senior crews to race in this period provided that there is a direct assessment of conditions immediately prior to such racing. It may be possible for the CU and organising committee to sanction intermediate and novice crews to race during the period between low and high water but only if there has been a direct assessment of conditions immediately prior to such racing. No crews comprising members who have less than two term’s rowing experience should boat during the ebb stream in ‘yellow’ flag conditions. The CU and organising committee may decide to revert to contingency plans (appendix 11); e.g. run the race upriver on the middle of the flood period. There will be a coxes’ briefing immediately prior to the race in case of any significant change to the format. The CU and organising committee may determine that it is possible to achieve safe racing conditions by curtailing the course (including starting at Brentford Ait or finishing at ULBC) – see contingency plan. If there is a significant change to the race format there will be an additional coxes’ briefing immediately prior to the race. Event advertised on PLA event calendar. Officials 4 and 7 to be on station promptly and monitor crossing points. Official 4 to control Syon crossing point, official 7 opposite UL. Pre-race information to coxes, only experienced coxes (30 hours experience minimum) permitted to race; emphasise care to be taken when proceeding to the marshalling zone to avoid other crews proceeding in the opposite direction on the flood (especially at the crossing points (upstream of ULBH and at Syon crossing). Race scheduled for as late as possible in the day to reduce conflict with non-event crews. Official 4 to hold crews below Syon crossing if excess congestion. Chief Umpire to check whole of marshalling area and check with control prior to starting race. CU will not start to turn crews until the river conditions (including other river traffic) appear suitable. Attention by marshals to keep crews against stream in correct position on Middlesex side. Crews will be seeded in last year’s finishing order to attempt to reduce the amount of overtaking required. 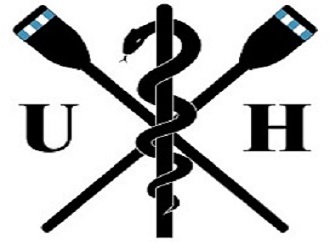 Launch 4 will be on the Syon crossing point to monitor both UH crews racing on the stream and non-UH crews crossing from Surrey to Middlesex against the stream. Officials to ensure crews turned and following correct course back to boathouse. Emphasis on proper navigation in in-shore zone at coxes’ and officials’ meeting. Official 7 to monitor returning crews especially whilst race still in progress.